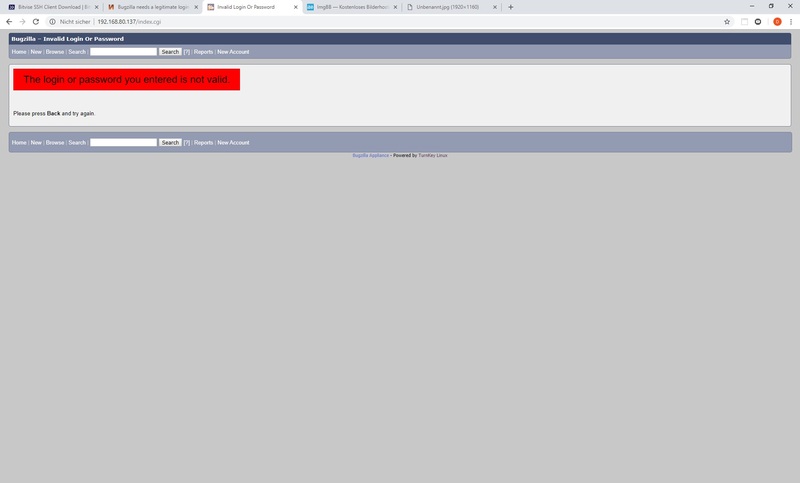 ...occurs when i try to log in with my admin user. when i create a new user (no admin user. normal registration process) i can log in..
Hmm, that sounds very strange! 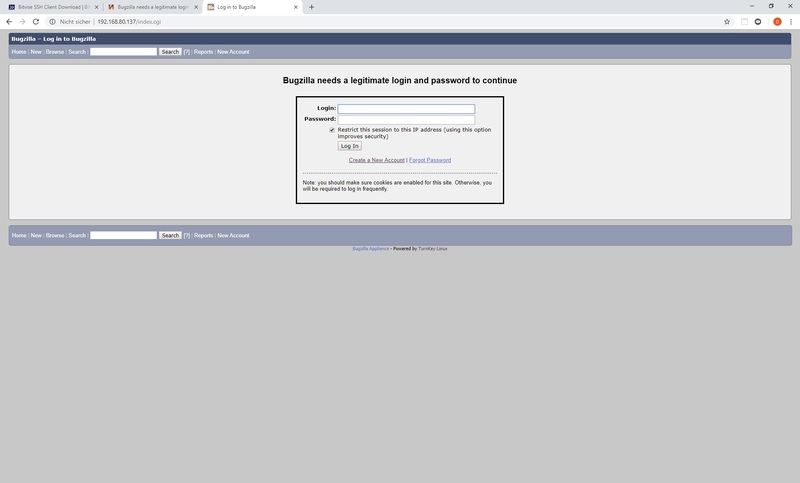 So to ensure that I understand correctly; you can log in ok with non-admin user, but admin user gets redirected to "Bugzilla needs a legitimate login and password to continue" page. Is that correct? Out of interest, if you can't log in with admin user, how did you manage to create a non-admin user to test this? Is this the default admin user that the appliance ships with (password set by firstboot/initialization scripts)? Or another admin user that you created? If you'e not using the v15.0 release (above command should return 'turnkey-bugzilla-15.0-stretch-amd64') and you don't yet have data in your appliance, I strongly suggest that you use that one! You can download it here. "you can log in ok with non-admin user, but admin user gets redirected to "Bugzilla needs a legitimate login and password to continue" page. Is that correct?" "Out of interest, if you can't log in with admin user, how did you manage to create a non-admin user to test this?" With that link: http://192.168.80.137/createaccount.cgi, i was able to create a new account with a "normal" registration process. without to be an admin user. "Is this the default admin user that the appliance ships with (password set by firstboot/initialization scripts)? Or another admin user that you created?" "Could you please confirm which version of TurnKey you are using?" Great, thanks for the additional info. Do you have data on this server already? If you don't (or don't have much) then starting again on v15.0 might be a good idea?! If you already have data, then fair enough. TBH, I'm a bit stumped. It doesn't make any sense to me that it's just not working without giving the log in failure message. If it was giving the log in failure message there may have been a logical explanation, but I can't think of one in this scenario.